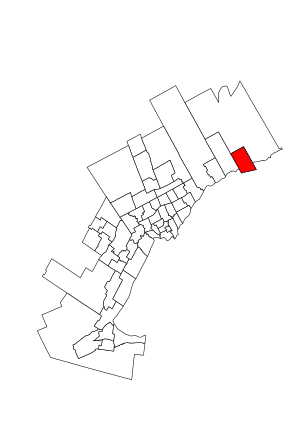 For the provincial electoral district, see Oshawa (provincial electoral district). Oshawa (formerly known as Oshawa—Whitby) is a federal electoral district in Ontario, Canada, that has been represented in the House of Commons of Canada since 1968. It consists of the City of Oshawa with the exception of the mostly rural areas north of Taunton Road, which are part of the riding of Durham. It was created as "Oshawa" riding in 1966 from parts of Ontario riding. It consisted initially of the City of Oshawa, the Town of Whitby and the part of the Township of Whitby between the west limit of the City of Oshawa and the east limit of the Town of Whitby and lying south of the road allowance between Concessions 2 and 3. 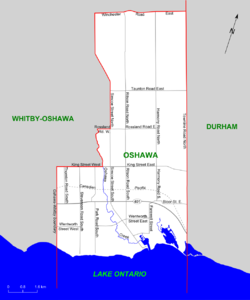 The name of the electoral district was changed in 1967 to "Oshawa—Whitby". In 1976, Oshawa—Whitby riding was abolished, and a new "Oshawa" riding was created from parts of Durham, Ontario and Oshawa—Whitby ridings. It consisted of the City of Oshawa. In 1987, it was redefined to exclude the part of the city north of Rossland Road and the allowance for road in front of lots 1, 2, 3 and 4, Concession 3. In 1996, it was defined as consisting of the part of the city to the south of a line drawn from west to east along Taunton Road, south along Ritson Road North, east along Rossland Road East, south along Harmony Road North and east along King Street East. In 2003, it was given its current boundaries as described above, and Whitby-Oshawa was drawn out of Durham and Whitby—Ajax. Oshawa lost territory to Durham, and gained territory from Whitby—Oshawa during the 2012 electoral redistribution. These changes resulted in electoral boundaries that effectively match the limits of the city of Oshawa. In recent years, the district has become a polarized two-way split between the Conservative Party of Canada and New Democratic Party. The Liberal Party of Canada has only managed distant third-place finishes in the past two elections. MP Colin Carrie was re-elected as the Conservative Party of Canada candidate in the 2011 federal election. Canadian Autoworkers Local 222 President Chris Buckley was the nominated New Democratic Party candidate and Gail Bates was the Green candidate. The Liberal Party candidate was James Morton. "(Code 35061) Census Profile". 2011 census. Statistics Canada. 2012. Retrieved 3 March 2011.